Like peeling a banana. The material is stripped away from the core columns like peeling a banana. Fine dust did not settle onto the vertical column like snow settles on the ground. Steel columns disintegrate into steel dust with WTC7 and water tower in the foreground. From 0:50-0:59, Lather is flows out of the east face of WTC7. It appears to be pulled out, as it is not freely flowing out of the open windows on the north face of WTC7 (toward the camera). From 1:01 onward shows the toasted cars up West Broadway. From 1:00-end, Toasted Cars up West Broadway. The firefighters calmly walk through the car "fire" (from the left). (4:30-4:50) fumes appearing to be pulled out. 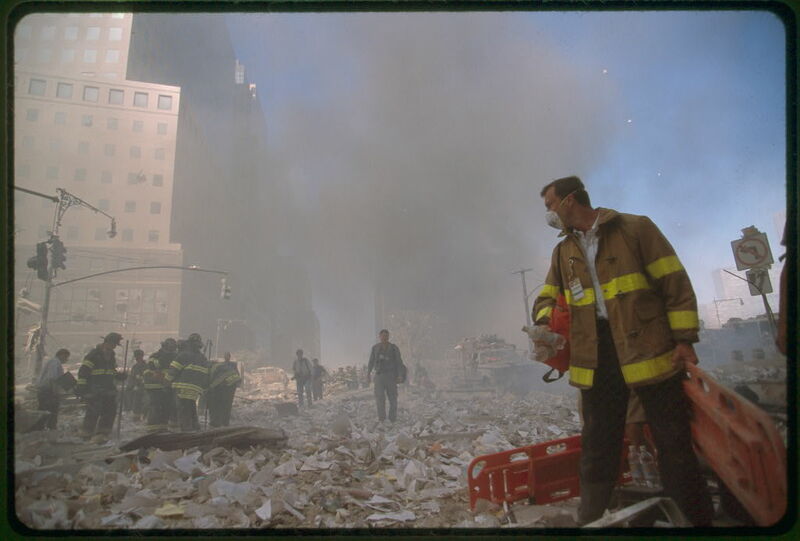 Flipped cars and little debris immediately following the destruction of the WTC complex. The lack of water on the street implies this was before the water main broke on West Street. "Hot things glow, but not everything that glows is hot." A Rock song from the 1970s, as a reminder of what we would have seen if thermite was used or if bombs were used. "Bombs go boom, but not everything that goes boom is a bomb." "Steel-toed Boots melt"? It's "1,100°F" on the pile? But I am not aware of any reports of burned feet. Mayor Giuliani said they were standing over 2,000°F fires, so why weren't they cooked? Turkey cooks in a 350°F oven. Watch the fuming block from about 0:24 - 0:31. HUTCHISON effect: Solid Iron Bar begins to liquify. Metal Mutation. jThe solid-iron block is about 2 x 2 x 7 inches. Watch the fuming car-door handle from about 0:00 - 0:07. When the signal is turned on, drops of water levitate and fall back down. As soon as the signal is turned off, the water is immediately calm. The appearance of "fire" usually occurs just after the signal has been turned off. Note the segment from 1:20-1:40. The toasted cars appeared to light up just after the towers were destroyed -- and while it was still dark from the dust blocking out all sunlight. The can appears to bend at the "waist," as if taking a bow, while no mechanical force is applied to the can. The massive beam is smoothly bent in the shape of a horseshoe. It is not buckled. A mechanism other than heat had to have done this. Figure 27a. Note, the fence still stands. Evidence of field effects. This car came to rest on the wooden fence during Hurricane Wilma. "Could gravity be related to its cousin magnetism?" Boyd Bushman's experiment is performed by others with similar results. (SNNS) Opposing magnets insde the rock cause it to fall slower. (NSNS) Attracting magnets inside the rock cause it to fall faster. "Faraday had served [Sir Humphry] Davy, whom he worshipped, extremely well as 'philosophical assistant' in experiments with chemistry and physics, but more and more he was being drawn to the study of this strange electric force which seemed to exist everywhere, to be conjured out of almost anything, like rabbits from a hat, and which, unlike the rabbits, seemed to promise a new strange magic, once man learnt to control it." "He was torn between chemistry, he had already, without bothering to explore its commercial possibilities, invented stainless steel, and the study of electricity. In his heart he knew he could abandon neither, but the fact that Sir Humphry was now switching his efforts to the latter made his choice for him; he had to help his master." "But then, instead of developing it, Faraday went straight on to investigate more fully the behaviour of electric currents near magnets, of wires near wires, of wires in the earth's magnetic field. He found that he could produce a movement similar to that of his experimental motor by using terrestrial magnetism instead of the bar magnet." In the 1790s, Alessandro Volta (1745-1827) discovered that if pieces of different metals were piled on top of each other separated by cardboard soaked in an acid, an electric current was produced. In 1820 Hans Christian Oersted (1777-1851) discovered electro-magnetism. Certain metals can be made magnetic by passing an electric current through a coil wound around a piece of them. The galvanometer, which measures the quantity of electricity, was invented following Hans Christian Oersted's discovery of electro-magnetism in 1820, and was named after Luigi Galvani. 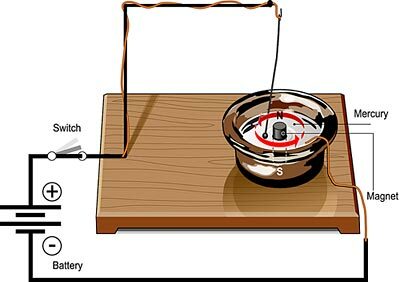 In 1821, Michael Faraday discovered that a vertically mounted wire carrying an electric current would rotate continuously round a magnet protruding from a bowl of mercury. This phenomenon, which Faraday called electro-magnetic rotations, showed that it was possible to produce continuous motion from the interaction of electricity and magnetism. in 1831 the electric generator was invented by Michael Faraday while exploring electro-magnetic induction. in 1886 Nikola Tesla (1856-1943) formed his own company, Tesla Electric Light & Manufacturing. © 2006-2011 Judy Wood and the author above. All rights reserved.